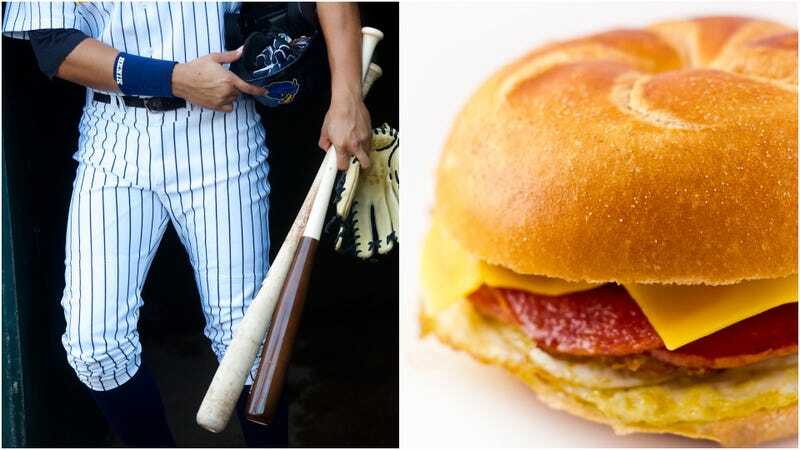 Because like any good New Jersey native I have a Google Alert set for “Taylor ham,” I was greeted by news this week that the New York Yankees’ AA team, the Trenton Thunder, will rename themselves Trenton Pork Roll on Friday nights beginning May 18. ESPN reports the team will wear uniforms depicting the processed pork product, and concession stands will offer special pork roll sandwiches and merchandise. “Thunder general manager Jeff Hurley says rebranding as the Trenton Pork Roll on Friday nights is the ‘perfect way to celebrate a Garden State favorite,’” according to ESPN. For those of you lucky enough to grow up in states not known for refineries and the phrase “gym, tan, laundry,” a primer on pork roll/Taylor ham: This gloriously salty, sliced pork product is a Jersey breakfast staple and is a distant, more processed cousin of Canadian bacon. It’s commonly fried on a griddle and served between egg and cheese on a Kaiser roll. Its preferred name is a source of contention that falls along certain geographic lines; even President Obama knew better than to wade into that quagmire. In Union County, where I grew up and where my parents still live, we called it Taylor ham after the classic Taylor brand. But pork roll is its technical, overarching, and government-approved term—try telling that to people north of Parkway exit 120. I was born in Belleville, NJ. Some of my family still lives there. My grandma would make this for breakfast for us whenever we visited. She would also send it to Wisconsin for special occasions. Last year, 2012, my boss at work order some Taylor Pork Roll for me for Christmas. He gave it to me on Thursday, December 20th and I just cried because it was such a special gift! It reminded me for visiting relatives in New Jersey and my grandma. Before I could share this gift with my Dad, he passed away the next day. See? Judy Klumb of Port Washington, Wisconsin just brought a damn tear to my eye. I never thought I’d be checking flights back to EWR to attend a Trenton Thunder, er, Trenton Pork Roll game, but I’ve done crazier things for love.